Sunny Opens Up at Mt Diablo! 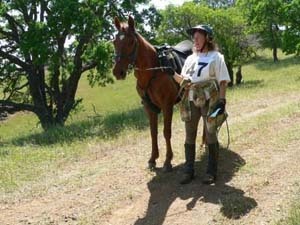 Well, it's been awhile, but the Competitive Trail Riding (CTR) season has officially started here in Nor Cal: the CMDTRA NATRC ride was run on Saturday, 7 May at Mt Diablo. This ride's roots are tangled up in the birth of NATRC, back in the 1960's, when a few people got excited and staged a competitive ride from Concord to Mt Diablo, then decided it was so much fun they'd do it again. 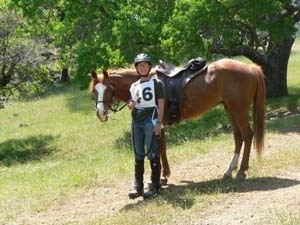 And again, and again - giving birth to the Concord-Mt Diablo Trail Riding Association: CMDTRA. Anyhow, the CMDTRA ride is always the season-opener here, although the route is now all on Mt Diablo. Faithful readers will recall that Sunny was winning the Horse competition pretty regularly last year, even though I counseled with her about the consequences of consistently good performance. She ended up winning five competitions in one year, and as a result, we got booted out of Novice class, where the routes are (relatively) short and the pace is (relatively) slow. So, if we want to ride this year, we have to ride in Open or Competitive Pleasure. 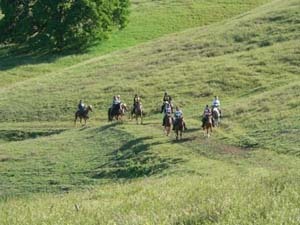 Competitive Pleasure is usually the same distance as Novice, but the pace is faster. Open is . . . open: the routes are the longest and the mandated pace is the fastest. Since our ultimate goal is to do an endurance ride, I decided that we'd move up to Open class, and the CMDTRA ride was going to be our debut. 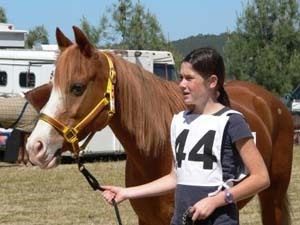 Our first setback was that Tango and Laura, our usual riding partners, were doing Competitive Pleasure. 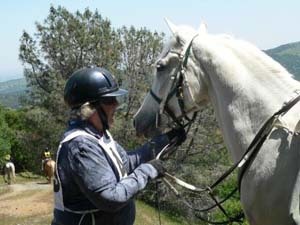 Tango hadn't gotten out as much as he needed to this Spring, so we were on our own, or as much as you can be on a NATRC ride. Dang! But we pulled up our socks and went anyway. The trip went well until I did my getting-to-be-a-tradition overshoot of the turn-off for ride camp, after which I turn into a feed store parking lot, confident that there will be room for us to turn around in there - but there's not. It doesn't seem right that there would be no place to turn a horse trailer around in a *feed store* parking lot. Sheesh. That said, a couple of customers stopped and spotted for me so I didn't run into their cars, so I guess we got through our first trail obstacle pretty easily. Laura and Tango had arrived first and saved us a primo location: right by the gap in the fence where you get to the trails, grazing, and round pen, and right by the hose bib. As soon as Sunny saw Tango she made a mare face, just for the record, and settled into eating. And drinking. I'd been experimenting with different water buckets and bucket placement - I know it sounds goofy, but on these rides, hydration is all-important, so it's crucial to make drinking as easy as possible for your horse, particularly a sissy-missy like Sunny. I know she likes drinking from the ground better than up on the trailer wheel-well , and I figured the reason the judges like to see the buckets attached to the trailer is so the horse won't get tangled in the handle somehow. Anyhow, I fastened her bucket-with-metal-handle to the side of the trailer, as usual, and, after consultation with Laura who seconded my reasoning, put a large bucket without handles on the ground next to the trailer. Note: I attended a couple of lectures at the AERC/NATRC convention this year where endurance vets talked about hydration factors. One of the most interesting factoids that human sweat is salty and the loss of salt in our blood triggers us to drink, but horses' sweat has the same amount of salt in it as their blood, so sweating doesn't change the concentration of salt, so horses don't have that signal that we do. The first clue for them to drink, if I understood correctly, is that when they get about a gallon low on water, their bodies quit delivering saliva to their mouths, which get dry and cause them to want to drink - but being a gallon down before they get thirsty is dangerous on a long ride, where water may not be immediately available. Horses. And mares. Sunny appears to have nothing but disdain for Tango on the trail, but in camp, if he's there, she's happy. I guess she figures if a horse as obviously dumb as Tango can survive, it should be a snap for her. Sorry, Laura, but what other explanation is there? Anyhow, when I finally looked around, the parking lot was full. Last year, there were 23 riders at this ride. This year there were 38 who started, 10 of them first-time NATRC riders and 9 juniors. What a great start to the season. At these rides, it's our habit to take a long walk around the venue as soon as camp is set up, but my foot (I broke three bones in my left foot in . . . February?) wasn't quite up to a long walk yet, so we a did short-distance, long-time grazing expedition, which seemed to serve the purpose for Sunny. Shortly after we returned to the trailer, it was time to go up to the clubhouse for dinner and the ride meeting. The CMTRA clubhouse has a kitchen, showers, and a real bar, so I actually had a beer with dinner. The ride meeting held no surprises and we were told that a horn would go off at 5:30 AM to prepare for our 7 AM start, so we broke up quickly and let the First Time Rider meeting get started. Note: the First Time Rider meeting is exactly that. 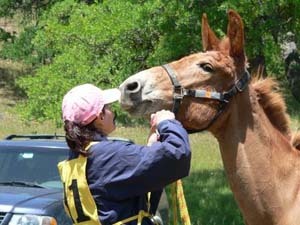 An experienced NATRC rider walks the first-timers through a ride: when to be at the starting point, what the trail markings mean, what will happen at a Pulse and Respiration (P&R) check, what the vet will look for, what the obstacles might be like, etc. I got back to the camper and collapsed. Usually at rides, I sleep about 2 hours at a time, then get up and check to make sure Sunny hasn't keeled over. This ride, the first time I woke up was 4 AM, and I quickly went back to sleep. The *next* time I woke up was 6 AM, and it was still quiet outside. I put on coffee and, as it was brewing, Laura knocked on my door: she had overslept, too, and was concerned that I was still asleep - I guess the fellow who was going to honk the horn overslept, as well. Getting started 30 minutes later than you planned on these mornings is stressful- if you have a routine that takes 90 minutes, trying to do it all in 60 minutes is really difficult because you're in a hurry *and* trying to overcome habits that you actually fostered. And it makes your horse nervous - Sunny *knows* what comes next in our prep and she firmly believes that most change is for the worse. But we made it to the start, where we discovered a possible reason for the lack-of-honk. The man who had brought 4 of the juniors to the ride had to return home in the middle of the night. The juniors wanted to stay for the ride, so management spent the night finding a sponsor for them, then getting in touch with their parents and getting permission for them all to stay. I guess honking a horn to wake the adults was low on their list of priorities, and rightly so. Open riders start out first at these rides; their pace is faster so they start out in front so they don't have to be passing the rest of the riders. The Boicellis went first: they both ride gorgeous Arab-Connemara crosses and go like the wind. Vicki Boicelli and Her Guy. Handsome, eh? After that, there were only 4 Open riders left: Angie, Karlie, Eric and me. The other three had planned to ride together. Angie has ridden Open for many years and has won about 10 National-level championships, I think. Eric is a friend of hers, and Karlie is a student of hers (Angie teaches equitation in Willets, up by Jackson Forest, and I was Karlie's sponsor on the Jackson Forest ride last year, since we were both Novices then). Anyhow, I asked if I could tag along. They said okay, and we stuck with them like glue for the entire ride. I hope you've gotten your money's worth of reading by this time because the rest of the ride is a blur. We had to do 27 miles, I think, at at average of 3.7 mph. It sounds easy, but in NATRC, you are discouraged from trotting uphill and you just plain can't trot downhill, and we were riding on Mt Diablo, where the longest stretch of flat ground in the first 22 miles was about 200 yards (we trotted it, of course). In addition, it's NATRC manners to wait for everyone at all the obstacles, P&Rs, etc and since there were four of us, the first person had to wait for the other three- so the first person through essentially has to take the last person's time, so Angie was losing a couple of minutes at every stop, and you only have a 30 minute window to finish. As a result, there was no time for taking photos or talking or breathing or much of anything. Although I can't cite specifics, the ride was beautiful - you ride around and up and down the skirts of Mt Diablo, so you get huge vistas of the delta, the sparsely populated areas between Walnut Creek and the Santa Clara Valley, and of Santa Clara Valley itself. The flowers were out and gorgeous, as well. At the ride meeting, we were warned, as we were last year, about baby pigs and rattle snakes. However, as last year, all we ran into were aggressive butterflies at the stream crossings. At this point, I'll circle back to the "orphaned" juniors whose sponsor had to leave. In NATRC rides, any rider under 16 (maybe?) has to be accompanied by an adult rider, so someone had to step up to ride with those juniors. Kay Liebernicht, who had brought a few juniors of her own, took on the job. And if you think the group I rode with had problems making time, think of what it would be like with 9 riders, many of whom are doing their first ride, and don't know what the process is. I think Kay worked up some good kharma on this ride. 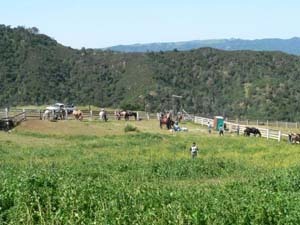 Our first real break was at lunch, which is in a pasture at a beautiful ranch. Ride management had brought hay out, but there was plenty of grass for grazing, too. We had a 45 minute break, so we could pull tack and sit down for a few minutes. And after that, it's a blank again, until the last about four miles. At that point, the trail sort of flattened out and we went for it. We were either cantering or doing an extended trot for the entire thing, except where we had to cross two streams, and for the last quarter mile into camp. I have to say it was exhilarating and Sunny seemed to like it, too. She got a little excited when we were cantering and somehow got into the lead, but she responded to my shut-down and we let the rest of the group pass and took up our Regular Station at the back, where she settled down. Did I say that there is usually a mule or two competing? This team won Competitive Pleasure. I had been hearing this squeaky noise for several miles and about six miles out Angie saw that it was Sunny's left hind shoe rotating - we'd worn out the nails again. (She sort of twists her foot as she walks, the faster we go, the less she does it, but it's always there a little bit.) Angie had an EasyBoot which she was willing to contribute to the cause and we didn't have a lot of options besides just going on, so we did. Just inside the 2 mile mark, after which you must maintain forward motion, Sunny threw the shoe, so she made it in with three shoes. After we got in, we had an hour-plus to clean up our horses, feed and water, etc before we had to report for our vetting out. When we through Sunny's metabolics and manners were excellent, but she got gigged for being "uneven on the left hind" on the trot out! I think it was true, but, dang, *I'm* uneven when I'm missing a shoe. Sheesh. And remember the unfastened water bucket I made such a big deal about? I got penalized for it. I talked to the judge about it and he said that avoiding getting tangled was certainly the primary reason to fasten the buckets, but he pointed out that, even if Sunny didn't get entangled, if she managed to tip it over, it could surprise her, cause her to pull back, affect horses in her area, . . . Good point. 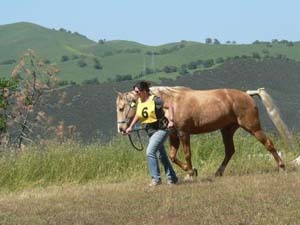 How to Trot Out Your Horse: the Faster the Better! We ended up coming in second in Lightweight Open; less impressive if you know that there was a total of two in the class, Angie & Reinbeau and Sunny & me - so you could also say that we came in last. I suspect that's going to be the story of the rest of our NATRC career, but coming in second to Angie is nothing to be ashamed of. We're just lucky Karlie is still competing as a junior!